In early December 1926 the mistress of crime Agatha Christie became the subject of a real life mystery that could have graced the pages of one of her own books when she went missing for ten days. Following a nationwide hunt Agatha was eventually discovered, ostensibly suffering from amnesia, in the Swan Hydropathic Hotel in Harrogate. Whether she’d really lost her memory, was suffering a breakdown from overwork and the death of her mother, or – as some have suggested – was seeking revenge on her husband who the night before had demanded a divorce so that he could marry his lover, we may never know. But it certainly helped put Harrogate on the crime writing map. Ninety one years later and Harrogate is again the centre of the crime writing world. The Swan Hydropathic Hotel – now somewhat more snappily renamed the Old Swan – last weekend played host to the Theakston’s Old Peculier Crime Writing Festival. What Agatha would have made of it is anyone’s guess. 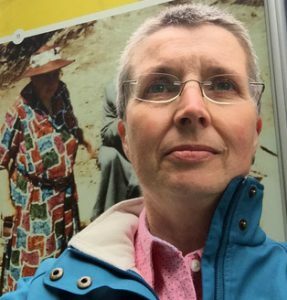 She couldn’t fail to have been impressed by the 16,000 crime writers, publishers, agents and fans who made what is now an annual pilgrimage to Yorkshire’s premier spa town. And despite the numbers it’s famous for its friendliness and informality. Crime writers spend much of their lives sitting alone in their room dreaming up ways to dispose of people, but when they escape from behind a desk they’re some of the most gregarious and generous-hearted folk you could wish to meet. 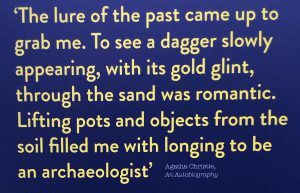 I hope Agatha would have been gratified to see the exhibition celebrating her life and work. 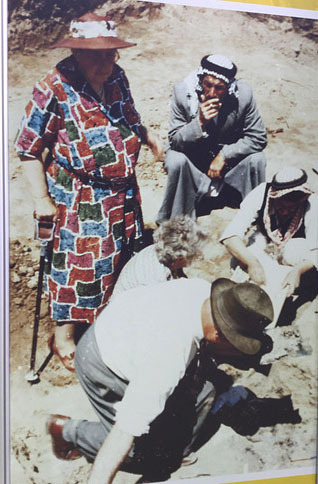 It celebrated too the inspiration she found in archaeology – her second husband Max Mallowan was one of the leading archaeologists of her day and Agatha, who spent many a happy hour trowel in hand, became as much of an expert at piecing together ancient pottery as she did in putting together the plots of her novels. So I like to think in some small way the two of us have more than a little in common. Agatha & me. Things in common. The glorious thing about Theakston’s Old Peculier Crime Writing Festival is that whatever your tastes run to in the world of crime fiction you’ll find something to suit, from the classics of the Golden Age to Ian Rankin (celebrating 30 years of John Rebus) or Lee Child (winner of this year’s Outstanding Contribution to Crime Fiction Award). And you’ll never be short of good company to share it with.